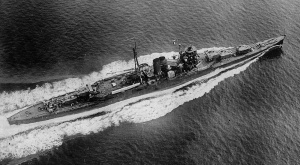 Cruiser Suzuya in 1935 during sea trials. During his active service from 1879-1928, Admiral Yamamoto Gonnohyoe participated in several conflicts such as Boshin War, First Sino-Japanese War and Russo-Japanese War. He was commander of the cruisers Takao and Takachiho His strategy toward China during the First Sino-Japanese war (1894-1895) was considered quite aggressive. Perhaps because of the participation in conflicts, he was promoted rapidly to read admiral (1895), vice admiral (1895) and Navy Minister (1898) and admiral (1904). He was also promoted to baron under the hereditary peerage of the Empire of Japan, which ruled between 1869 and 1947. Yamamoto showed strong leadership and wise decisions when he appointed Togo Heihachiro as commander-in-chief of the Combined Fleet. At that time, Admiral Yamamoto was Minister of the Navy and Japan was involved in the Russo-Japanese War. Further promotions and honors included to become count in 1907. Then, count Yamamoto served as Prime Minister in 1913–14. Although closely vinculated to politics in the late period of his active life, Yamamoto abandoned political life completely in 1924. He died in 1933 and his grave is at the Aoyama Cemetery in Tokyo. Marshal Admiral Ijuin Goro was born in Kagoshima city. He was the son of a samurai and fought as a Satsuma samurai and foot soldier during major actions in the Boshin War (1868) . Ijuin entered the 4th class of the Imperial Japanese Naval Academy (1871), and as cadet served on vessels of the early Imperial Japanese Navy. He participated in the Taiwan Expedition (1874), the Ganghwa Island incident off Korea (1875), and the Satsuma Rebellion (1877).Surprisingly, he had international experience since he was sent to England for study in 1877 and completed courses at Royal Naval College, Greenwich. After he became Vice-Chief of the Navy General Staff during the Russo-Japanese War, he progressed quickly and successively assumed the positions of commander-in-chief of the Nihon Kaigun 2nd Fleet, the Nihon Kaigun 1st Fleet, the Combined Fleet, and then became Chief of the Imperial Japanese Navy General Staff (1909–14). He was quite fanatical about training and sailors highlighted this lack of vacation or free time in a popular song in which there are no weekends “Monday-Monday, Tuesday, Wednesday, Thursday, Friday-Friday”. He was honored with the title of danshaku (baron) in 1907 and promoted to admiral on 1 December 1910 and marshal-admiral (fleet admiral) on 26 May 1915. This is surprising since he was never having actually commanded a ship. His grave is at Aoyama Cemetery in Tokyo. Admiral Ijuin Matsuji was his son and he was also a navy officer and was killed during the Battle of Saipan in 1944. After studying navigation and under the rule of the new Meiji government, Kawamura Sumiyoshi became an officer in the still under development Imperial Japanese Navy, and steadily rose through the ranks. He became first Director of the Imperial Japanese Naval Academy in 1870 and taifu (senior vice minister) of Navy in 1872. He was in command of Japanese naval forces during the Taiwan Expedition of 1874. In 1878, Kawamura became councillor and in 1884, he was ennobled with the title of count. Later serving as court councillor and Privy Councillor, in 1901 he was given responsibility for the upbringing of the newborn Prince Michi (the future Emperor Hirohito) and his younger brother Prince Chichibu (Yasuhito). In 1904, Kawamura was posthumously appointed to the rank of admiral, setting a precedent for such honors. A mystery still involves his life since the causes of her death are still unclear nowadays. Nakamuta Kuranosuke was a samurai-sailor in the existing navy and captain of frigate. After the establishment of the Meiji government and the official creation of the Imperial Japanese Navy, Nakamuta was given the rank of commander (1870) and became deputy commandant of the Imperial Japanese Naval Academy. He was promoted to captain in 1871 and rear admiral the same year. He also became commandant of the Naval Academy in 1871. He was promoted to vice admiral in 1878. He was appointed Chief of the Imperial Japanese Navy General Staff in 1892, and was concurrently commandant of the Naval Staff College. He was also honored as viscount title and as a member of the Privy Council in 1894. From there, it was notorious his opposition against the First Sino-Japanese War. Perhaps due to this, he was forced out of active duty and into the reserves in 1900 by his political rivals. He retired in 1905 and died in 1910. His grave is at Aoyama Cemetery in Tokyo. Enomoto Takeaki was very cultivated samurai and admiral of the Tokugawa Navy. He studied at the Tokugawa shogunate’s Naval Training Center in Nagasaki and at the Tsukiji Warship Training Center in Edo. When he was still under 30 years old, he was sent to the Netherlands to study western techniques in naval warfare and technologies. He stayed in Europe from 1862 to 1867. This is a long period of 5 years which was not usual at that time. Therefore, he became fluent in both the Dutch and English languages. He remained faithful to the Tokugawa shogunate and fought against the new Meiji government until the end of the Boshin War. He later served in the Meiji government as one of the founders of the Imperial Japanese Navy. In 1887, Enomoto was honored with the rank of viscount and a member of the Privy Council. Enomoto, based on his international experience, was especially active in promoting Japanese emigration through settler colonies in the Pacific Ocean and South and Central America. In 1891, he established a special section for emigration in the Foreign Ministry, with the task of encouraging emigration. Enomoto died in 1908 at the age of 72. His grave is at the temple of Kissho-ji, Bunkyo-ku, Tokyo.